Two angles of a triangle are of measures 150° and 30°. Find the measure of the third angle. One of the angles of a triangle is 130°, and the other two angles are equal. 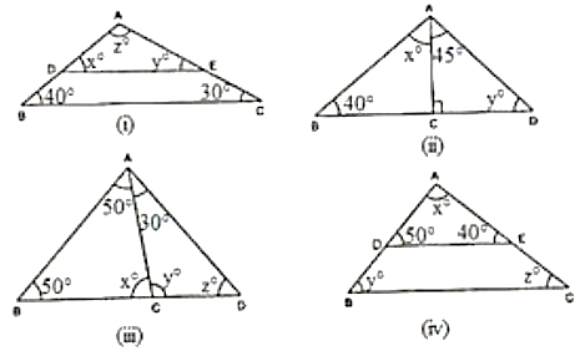 What is the measure of each of these equal angles? The three angles of a triangle are equal to one another. 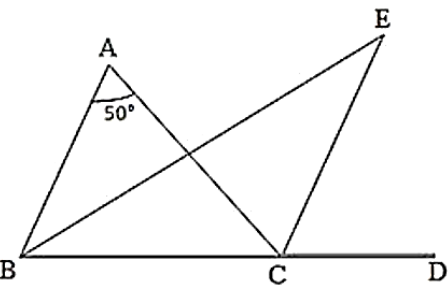 What is the measure of each of the angles? The angles of a triangle are (x − 40) °, (x − 20) ° and (1/2 − 10) °. Find the value of x. 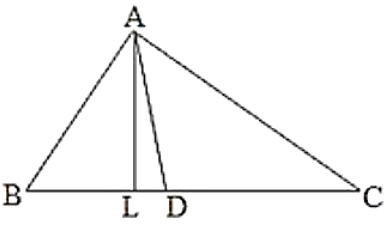 The angles of a triangle are arranged in ascending order of magnitude. If the difference between two consecutive angles is 10°. Find the three angles. If one angle of a triangle is equal to the sum of the other two, show that the triangle is a right triangle. Two acute angles of a right triangle are equal. Find the two angles. One angle of a triangle is greater than the sum of the other two. What can you say about the measure of this angle? What type of a triangle is this? Therefore, we can conclude that the three angles of the given triangle are 40°, 30° and 110°. 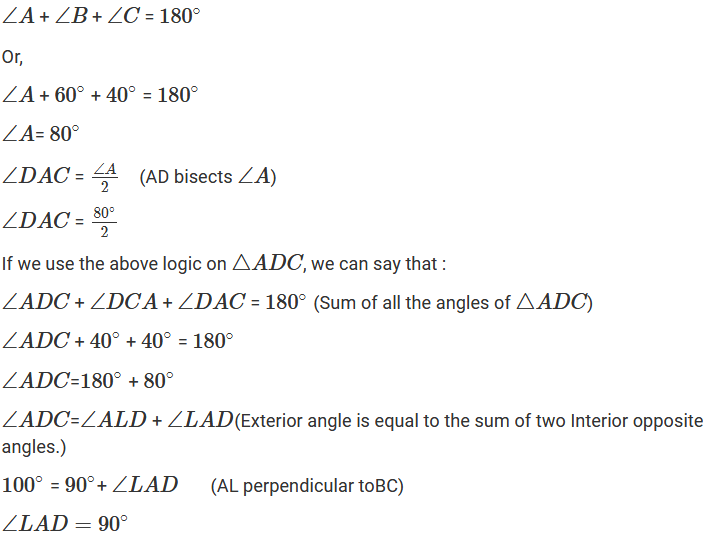 (ii) We can see that in ∆ADC, ∠ADC is equal to 90°. 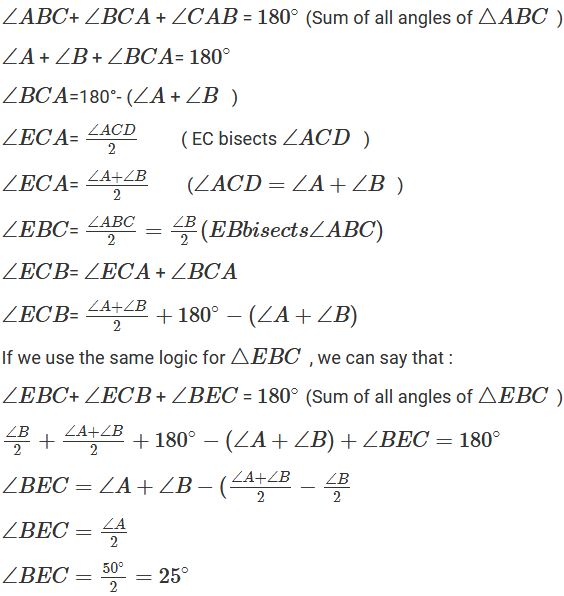 We also know that the sum of all the angles of a triangle is equal to 180°. y = 180° – 135°. We can also say that in ∆ABC, ∠ABC + ∠ACB + ∠BAC is equal to 180°. Therefore, we can say that the required angles are 45° and 50°. 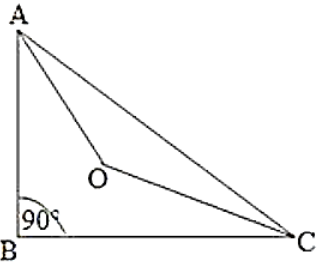 (iii) We know that the sum of all the angles of a triangle is equal to 180°. Therefore, we can conclude that the required angles are 80°, 50° and 100°. We know that the sum of all the three angles of a triangle is equal to 180°. Therefore, we can conclude that the required angles are 50°, 40° and 90°. We also know that the other two angles of the triangle are in the ratio 1: 2. Let one of the other two angles be x. Therefore, the second one will be 2x. Hence, we can conclude that the required angles are 40° and 80°. It one angle of a triangle is 100° and the other two angles are in the ratio 2: 3. find the angles. We know that one of the angles of the given triangle is 100°. We also know that the other two angles are in the ratio 2: 3. Let one of the other two angles be 2x. Therefore, the second angle will be 3x. We know that the sum of all three angles of a triangle is 180°. Thus, the required angles are 32° and 48°. In △ABC, if 3∠A = 4∠B = 6∠C, calculate the angles. Therefore, the three angles of the given triangle are 80°, 60°, and 40°. (i) Two of the angles are right? (ii) Two of the angles are obtuse? (iii) Two of the angles are acute? (iv) Each angle is less than 60°? (v) Each angle is greater than 60°? Give reasons in support of your answer in each case. (i) No, because if there are two right angles in a triangle, then the third angle of the triangle must be zero, which is not possible. 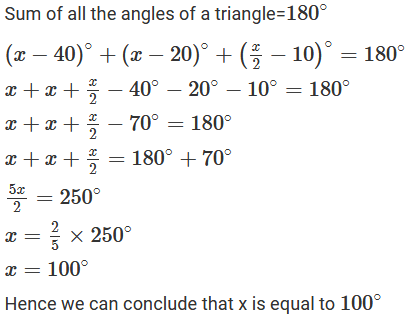 (ii) No, because as we know that the sum of all three angles of a triangle is always 180°. If there are two obtuse angles, then their sum will be more than 180°, which is not possible in case of a triangle. 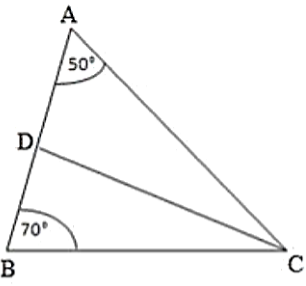 (iii) Yes, in right triangles and acute triangles, it is possible to have two acute angles. (iv) No, because if each angle is less than 60°, then the sum of all three angles will be less than 180°, which is not possible in case of a triangle. 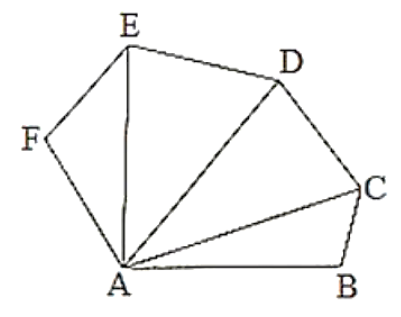 Let the three angles of the triangle be ∠A, ∠B and ∠C. We can see that the sum of all three angles is less than 180°, which is not possible for a triangle. Hence, we can say that it is not possible for each angle of a triangle to be less than 60°. (v) No, because if each angle is greater than 60°, then the sum of all three angles will be greater than 180°, which is not possible. We can see that the sum of all three angles of the given triangle are greater than 180°, which is not possible for a triangle. Hence, we can say that it is not possible for each angle of a triangle to be greater than 60°. 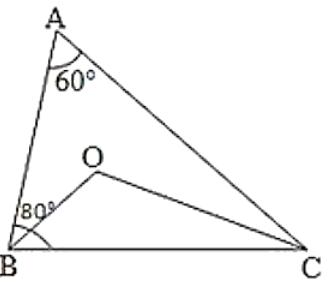 (vi) Yes, if each angle of the triangle is equal to 60°, then the sum of all three angles will be 180° , which is possible in case of a triangle. We can see that the sum of all three angles of the given triangle is equal to 180°, which is possible in case of a triangle. Hence, we can say that it is possible for each angle of a triangle to be equal to 60°. We know that the sum of all three angles of a triangle is equal to 180°. 60° + 80° + ∠C= 180°. The bisectors of the acute angles of a right triangle meet at O. Find the angle at O between the two bisectors. 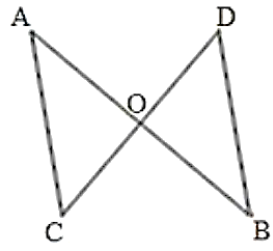 In ∆ABC, ∠A = 50° and BC is produced to a point D. The bisectors of ∠ABC and ∠ACD meet at E. Find ∠E. Line segments AB and CD intersect at O such that AC perpendicular DB. It ∠CAB = 35° and ∠CDB = 55°. Find ∠BOD. We know that AC parallel to BD and AB cuts AC and BD at A and B, respectively. We also know that the sum of all three angles of a triangle is 180°. In the given triangle, AC parallel to QP and BR cuts AC and QP at C and Q, respectively. 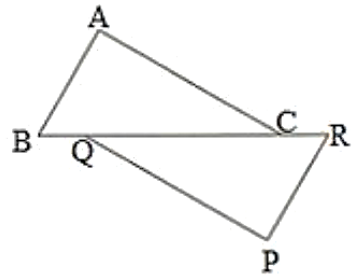 ∠ABC = ∠PRQ (alternate interior angles).